Tacos like these from Tacos El Vagabundo may be endangered with more food truck regulation. At 2 a.m. on a Saturday, on the corner of East Second Street and Avenue A, there are at least 30 people standing around a Mexican food truck waiting for their $3 quesadillas and $7 burritos. The food truck business, you might think from this scene, is booming. But like every other story in this city, it's not that simple. When they're not swarmed by late-night revelers looking for a snack, the streets are hard for food trucks. I might have to wait 20 minutes for my cheese quesadilla on a weekend night, but at other times, there is no line at all. And though that's great for me, it's less great for the guys trying to make their living this way. But even when the cash is flowing in, our dicey regulatory framework means that the food truck business is always a precarious one. Governed by an unclear mish-mash of rules that are not just hard to follow but also erratically and unevenly enforced, food truck operators can hardly be blamed for breaking the law here and there. Some people say this is a good thing. In a July 2011 New York Times op-ed, Midtown Lunch founder Zach Brooks wrote, "Vendors and fans are actually better served by the status quo [because] ... the vague rules have long deterred any passionless big businesses looking for the next lucrative franchise." Others see it differently: In May, after sorting through the mess of conflicting food truck laws, Adam Davidson, author of the New York Times Magazine's "It's the Economy" column, came to a different conclusion -- "The Food-Truck Business Stinks." As food trucks continue to proliferate, our regulators will have to clear up some of the vagueness in the laws. And if you value the eclectic, low-budget, high-taste offerings that the mobile meal cart business brings to our city, you might be wondering which candidate will do more to support that industry's cause. But again, there is no simple answer. While Bill de Blasio celebrated his primary win with a party featuring LCD Soundsystem on the playlist and, as the Bedford + Bowery blog described it, "a Smorgasbord-esque assortment of gourmet food trucks," he has also called for more regulation of the mini-industry. In May 2012, the Brooklyn Daily reported that he sides with brick-and-mortar restaurants that see food trucks enjoying unfair advantages because, for example, they don't need to post inspection grades in their windows. "The fact is right now that the weight of regulation falls on our traditional businesses," he said. Joe Lhota, meanwhile, says food trucks clog roads, and he calls for more parking regulations. "They send you a tweet and let you know what corner they'll be at. It's part of their business model," Lhota said in May. "They're parked all over the streets, on every corner of the city, and they cause congestion." 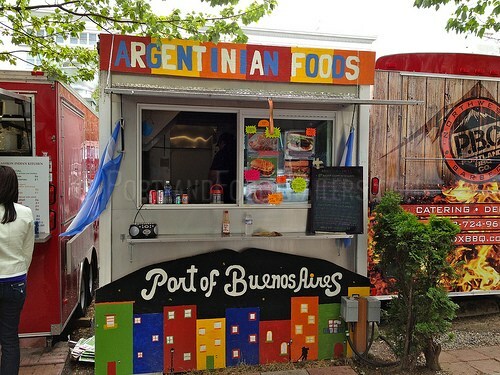 So are food trucks doomed no matter who moves into Gracie Mansion? Not necessarily. I asked Ben Max, founder of Decide NYC, a website tracking all of the issues in the races. "It would seem that Lhota wouldn't want to bog down these entrepreneurial folks with too much regulation whereas de Blasio might be likely to impose more so that they are playing by similar rules to regular restaurants," he tells me. "But," he adds, "who the heck knows with these two?"